Having a Healthy Disregard for the Impossible – Larry Page. A Marathon is an amazing experience. You wake, get herded behind the line on some empty street, a gun is fired, and you run until you drop. There are no wickets to take or defencemen to manoeuvre around – just kilometers to run. You reach the starting line at dawn on a frigid morning and because the night before you woke in pure panic every 30 minutes believing that you’d overslept and missed the race, you’re already exhausted. Self-doubt arrives shortly after the starting gun. But, by mid-race, this doubt is swallowed by fatigue. On a rainy evening a year and half later, I can still see the pavement in front of VIdhana Soudha as I struggled to the finish line at the inaugural Bangalore Marathon. - Johnson in the Sunday Times of India, September 17th 2006. And even as many are reading this in the luxury of their homes that Sunday morning, I and a few others were living every word Johnson wrote. 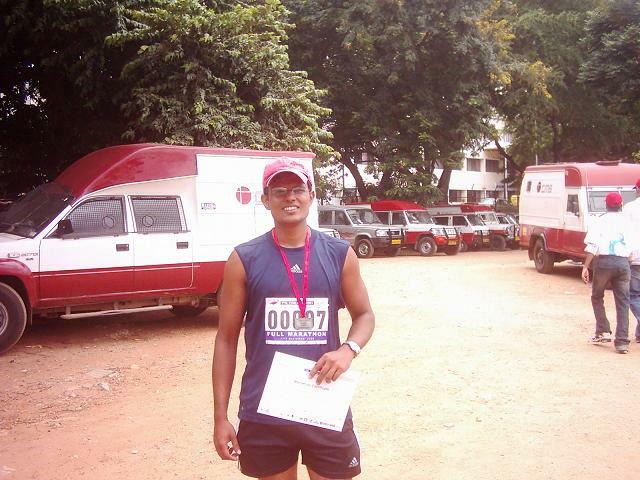 The second Bangalore International Marathon was held last Sunday. This time it was a part of a larger Refresh Bangalore initiative, The Times of India the main sponsor. I had started the practice in Aug, running about 50kms a week, but with no news of the marathon, I went slow mid way. With only 10 days left for the marathon, TOI started registrations. In the last minute ditch effort, I cycled up Nandi hills (about 100kms), only to injure my already damaged ligament of the left knee. The week leading to the marathon was a concoction of feelings – fear, anxiety, apprehension and disquiet, primarily fear. The knowledge of the track (which was same as last time) was the root cause of this. And I had set an ambitious target of 5 hours for the finish. I ran a 5kms on Thursday and spent the next couple of days in nursing my knee. I did this last time too, I sure am not learning from my mistakes. 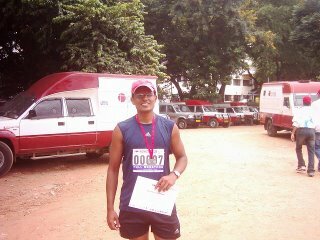 So, here I was, at 6 am on Sunday morning, running yet another Bangalore Marathon. I spotted a lot of familiar faces from Runners For Life and Bangalore Hash. Water stations: The water stations had water till we finished. There were guys around even when I returned home as late a 7hours after the start. Simply sooper, I say!! Weather: So much better, running in Sep and not in May. I was at Hebbal on my way back when I first noticed the sun. Timing: I ran the first 13kms in 1.5hours, reached the half way point (21kms) in 2hours 20mins. The next 12kms to Hebbal took me 1 hour 40mins. By that time, I had done nearly 31kms in 4hours. In the scorching summer in May last year, it had taken me 5 hours to do this! The next 10-11 kms took me 1.5 hours of a mix of walking and jogging. Running: This time I jogged without a stop for the first 26kms. Last year, I had stopped before the half way point. And after the 26 also, there were longer stretches of jogging than walking. Running mate: When I reached Hebbal in just over 4 hours, I was overtly pleased with myself, despite my over-worked joints and legs. It was then, the mind took over and I had gotten walking mostly. In all fairness, I had submitted myself to walk to the finish by then, I had time on my side (the brain conjures many such mirages). And I had this one bad experience last year, running with a state team rowing member, so this time, I wanted to motivate only myself and no other. Then came Shyam, walking briskly past as we went up the Hebbal flyover. From then on it was his optimism that took me to jogging again. Be it the distance, the sun behind us, the pain in the joints, the killing pain in my knee, the glass was always half full for him. We struck a chord easily with him sharing my passion for ‘thunderbird’ing and ‘hero hawk’ing. We finished together in 5 hours and 30mins. The finger: There was this one pot-bellied middle aged man, waiting for the traffic to clear, who was shouting at the runners in Kannada, "if you run like this, you will fall sick". The least you can do to help, my fellow Bangalorean is to keep your crapping mouth shut. I had to show him The Finger. The Applause: Shyam and I were nearly crawling on the 37km mark, near high grounds police station. One constable was rolling up the police-do-not-cross tape, the moment he saw us, he put the tape down, ran off to avoid coming in our way and stood to applaud us as we passed him. A small gesture, it made my pain disappear. The Medal: Unlike last time, when I got the medal and certificate one week after the run, I was early enough to pick it up immediately. Since then, I have been flaunting the medal everywhere. If you want to see it post a comment, I shall mail a pic. Ps: My chest number was not 00007 for nothing. Soooper !!! hats of to your spirit !!! I guess I shouldn't be surprized with anything you do. Talk about timing - you almost made your target time. Good writing too - it's not just your running that has improved. Thanks maga. The next half marathon is happening on 24 Dec. You should consider joining. 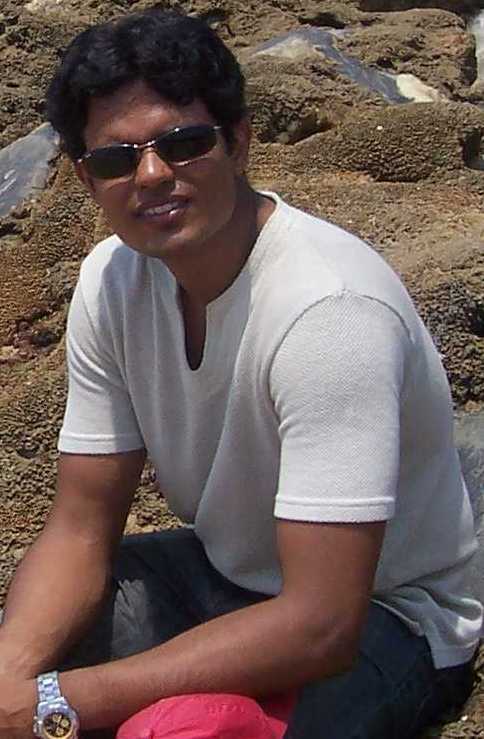 I dunno abt my writing, but your writing just made my day :) Thanx. inspiration coming .. hope to do this next year or sometime soon..